This article is about the history and nature of the recurring event; for the individual events, see from 2003 Sundance Film Festival, etc. through to current year. ^ Stambro, Jan Elise. "The Economic Impacts of the 2016 Sundance Film Festival" (pdf). Bureau of Economic and Business Research. University of Utah. Retrieved 2012-11-06. ^ Cairns, Becky. "Sundance Film Festival drops Ogden as screening location". Standard-Examiner. Retrieved 2017-06-28. ^ "BBC - Films - Sundance Film Festival - A Brief History". www.bbc.co.uk. Retrieved 2017-07-14. ^ "Redford's Wildwood Enterprises and PBS Bring "Skinwalkers" to the Small Screen | PBS About". Redford's Wildwood Enterprises and PBS Bring "Skinwalkers" to the Small Screen | PBS About. Retrieved 2018-01-28. ^ Craig, Benjamin. "History of the Sundance Film Festival". Sundance-A Festival Virgin's Guide. Retrieved 2012-10-08. ^ Peden, Lauren David (December 2005). "Sundance Subdued". Freedom Orange County Information (coastmagazine.com). Archived from the original on 2007-09-27. Retrieved 2007-11-11. ^ "Sundance London 2014 unveils lineup". Digital Spy. 2014-03-24. Retrieved 2015-11-16. ^ "Sundance London 2015 cancelled, festival's future under review". Telegraph.co.uk. Retrieved 2015-11-16. ^ Pierrot, John-Paul (2016-04-20). "Sundance Film Festival: London 2016 – Programme Announced". Picturehouse Blog. Retrieved 2017-07-21. ^ Pierrot, John-Paul (2017-04-25). "2017 Sundance Film Festival: London – Programme Announced". Picturehouse Blog. Retrieved 2017-07-21. ^ "Sundance". hk.sundance.org. Retrieved 2017-07-21. ^ "Sundance Mixed With Stars, Politicians". BAM. Archived from the original on 2008-01-12. Retrieved April 4, 2014. ^ "The Complete List of Movies Sold at Sundance 2016, and Why Amazon and Netflix Went All Out". Vulture. Retrieved 2017-08-08. ^ Clark, Cody (January 22, 2010). "Redford launches 2010 Sundance Film Festival in Park City". The Daily Herald. Retrieved 2010-01-22. ^ Kay, Jeremy (11 March 2009). "John Cooper steps up as director of Sundance Film Festival". ScreenDaily.com. Retrieved 2010-01-31. (Subscription required (help)). ^ Cieply, Michael (17 February 2009). "Shakeup in Film Festivals as a Familiar Face Moves". The New York Times. Retrieved 2010-01-31. ^ "Sundance Institute announces John Cooper as Director, Sundance Film Festival" (pdf) (Press release). Sundance Institute. 11 March 2009. Retrieved 2010-01-31. 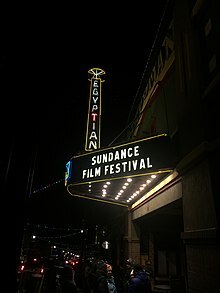 Wikimedia Commons has media related to Sundance Film Festival.